Today’s ride: The Back Roads Century is held at the end of September in Berryville Virginia. The century course has two loops; 50 miles north through West Virginia, and another 50 miles south through Virginia. The metric course uses the south loop, and both loops give you great views of the Blue Ridge mountains. The course is rolling, and the century has approximately 4000 feet of climbing, with more climbing on the south loop than the north. Starting early is a good idea for this century, and the morning is typically cool, but the course loops back to the start, so any jackets or warmers you take on the north loop you can remove before the south loop. The roads are mostly rural, and there is seldom traffic to worry about apart from the times when he ride crosses local highways. The rest stops are well done, with special treats like salted baked potatoes and tomato and cucumber sandwiches. 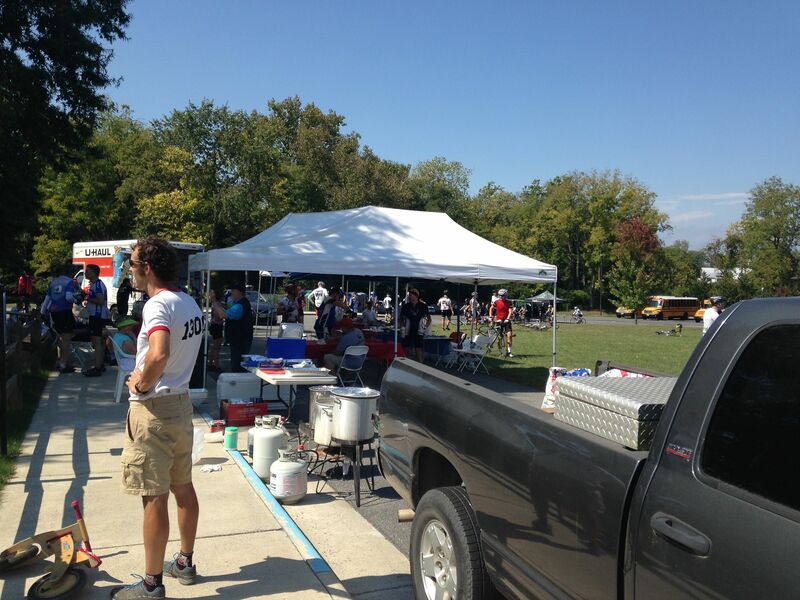 Potomac Pedalers Touring Club holds this ride, and the volunteers do a good job for the riders. The Experience: I arrived before dawn, having gotten up early and driven for an hour and a half to arrive at the start before many of the volunteers. I prepared to go in the early light, and rolled out with Carol, Eric, john and Carol’s friend Johanna. The morning was cool, and I wore arm warmers for the first loop. The local authorities chose to crack down on the cyclists on the ride, and some riders were ticketed, but it seemed to me that they were being antagonistic. John got going quickly with other riders, but the rest of us stayed together. We rolled into West Virginia and made it into the first rest stop at a good pace. The day was starting to warm up, and we headed back toward Berryville with the mountains around us lighting up as the sun rose higher overhead. We finished the first loop easily, with Eric and I getting out ahead of Carol and Johanna on the climbs. We joined up again for the start of the second loop, and John stayed with our group, but Johanna began to feel ill and abandoned. The rest of us collected ourselves at the 62 mile rest stop. Once again, Eric and I stayed together, with Carol and John pacing each other behind us. With the heat building and the road rolling, Eric began to slow. He had been on vacation and had been off of the bike for a few weeks, so as the road rolled, I stayed with him as much as possible to keep the team together. We got a break at mile 79, as well as some fabulous tomato sandwiches, and attacked the next set of rollers. We were past tired as we made it to mile 92 and the final rest stop, and had some shaved ice to cool down. John and Carol found us before we left, but we set back out and rode strongly for the final 8 miles. The rolling terrain was a challenge in the last 35 miles, but the views of the Blue Ridge were spectacular, and the weather favored us to help make this year’s Back Roads Century another memorable ride. Selections from my mental iPod during the ride: “If I Didn’t Love You” by Squeeze, “What Difference Does It Make” by The Smiths, and “Obscurity Knocks” by the Trashcan Sinatras. Stats: 100.54 Miles ridden. The day showed us the best of the Blue Ridge. A scene from the rest stop at Mile 62. 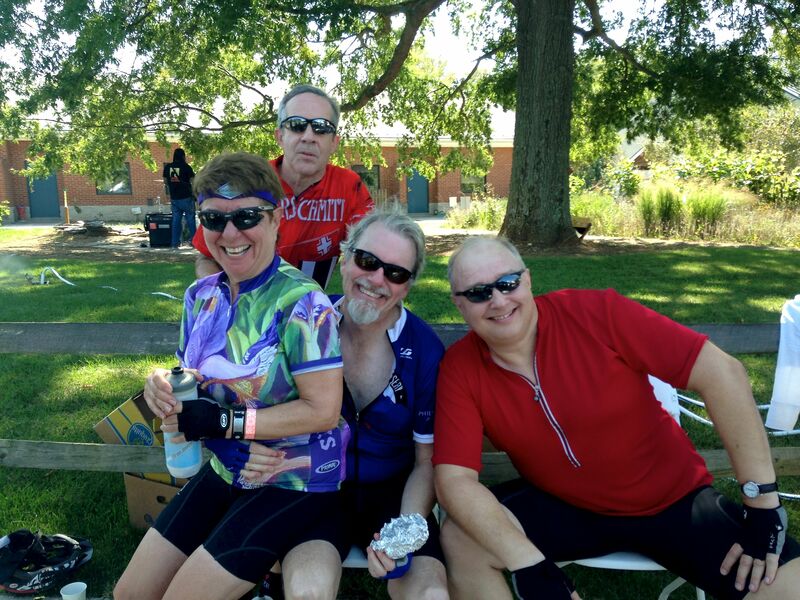 The crew that rode the Back Roads: Carol Linden, John Koehnlein, Eric Sanne, and myself. 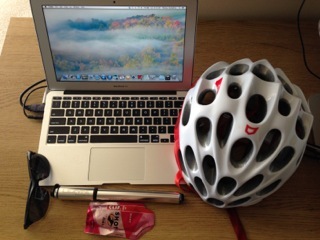 This entry was posted in Cycling on September 24, 2014 by kitefencer.